10 most common airbrush problems are presented and the solutions for them. Not every airbrush system can work like a charm; therefore, this article will present to you the most common airbrush problems and the recommended solutions. Hopefully you will find useful advice and solve your problem. This is a problem that can happen sometimes, and usually at the completely wrong moment when you need to use the compressor right away. Make sure it is plugged in correctly. Try spraying; it might be full of air. Take the air tank and the moisture trap and drain all the water. Leave the compressor on for 30 minutes and unscrew the hose (it might be over heated, so it will turn on by itself). Use the warranty and call the manufacturer. The problem could be with the motor or the electrical system. 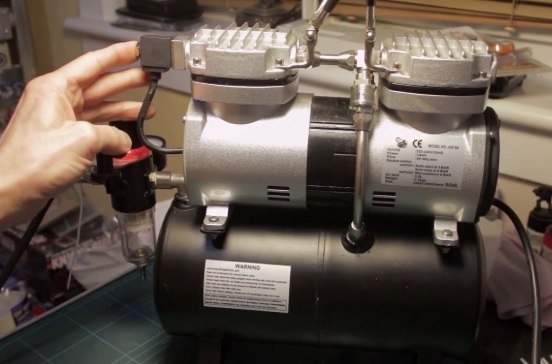 Check out the Airbrush compressor buyer’s guide. This can happen due to loose parts, improper mounting, troubled crankcase and problems with pistons. Check the pulleys, flywheel, cooler, clamps, belt, accessories for any looseness. Just find it and tighten it. If the compressor is improperly mounted, refasten the bolts and check if the vibration pads need to be replaced or installed. Defective or oil-deficient crankcase – check if new oil or bearings is needed or replaced. Piston hit the valve plate and now there is noise, so take the cylinder head out and check for dirt on the piston. After that switch the gasket and reattach the head. The most often cause for this problem is a blocked nozzle, but it can also be thick paint, a loose needle chucking nut as well as low or inadequate air pressure. Clean and soak the nozzle to unblock it. Thin your paint with a suitable reducer and then try spraying. Check if the needle-chucking nut is loose and tighten it. If the issue is the pressure, try increasing it, it might be too low to atomize the paint. You got the airbrush in your hand and you’re ready to go, then you realize there is a clog. This problem has a quick and easy solution. Strain and thin the paint. Deal with the tip dry. Rinse out the airbrush by turning up the air pressure. Also to prevent this from happening, use an airbrush ready paint. This can be caused by the needle not sitting flush in the nozzle. Unscrew the needle-locking nut and then lightly push the needle forward till it is inside the nozzle. After that, tighten the needle-locking nut. It cases where the airbrush sprays just a blob of paint when the trigger is depressed. Pull the trigger back for paint flow. Spray and then return the trigger forward before releasing it/air flow. Shut the pain flow off before the airflow sprays any residue paint. This can be caused by a loose air valve closure or guide screw, or due to residue paint or solvents that enter the air valve and cause the air valve seals to be sticky or even swollen. In the first case: tighten the air valve closure/guide screw. This will shut off airflow by compressing the air valve spring. In the second case: Internal air valve components need to be disassembled and lubricated with airbrush lube and then reassembled. The air valve seals need to be replaced if they eroded by solvents. The cause is the needle tip which is bent. Use a flat sharpening stone to straighten the needle tip. This problem in particular has various causes, starting from paint consistency, damaged needles, low air pressure, partially block nozzle or tip dry. For thick paint, just use a suitable reduce and reduce the paint to a milky consistency. If the needle is damaged, just remove it and clean it using a cloth dampened with airbrush cleaner. For low air pressure just increase it until the paint atomizes. Nozzle and tip dry – remove the needle and then the tip dry. If residue pain tis build-up in the needle cap, nozzle or air cap, just clean it or replace it if needed. 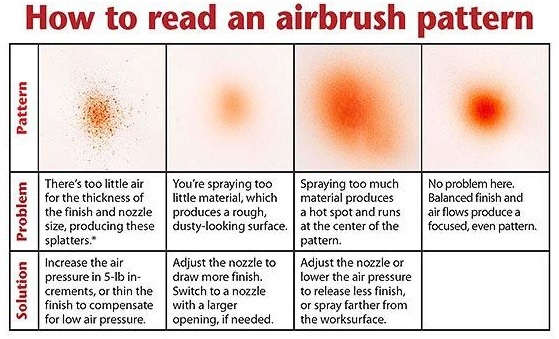 Check out the Airbrush paint buyer’s guide. If the paint is over reduced and is too thin or runny this can easily happen. In addition, it can occur if the paint is applied too heavily on a non-porous surface or even by operating at a very high air pressure. Add paint into the mix or reduce the air pressure. For too much paint applied just do not draw the trigger back so far or even increase the distance from the surface. Clearly, this means that air pressure has entered the paint reservoir. 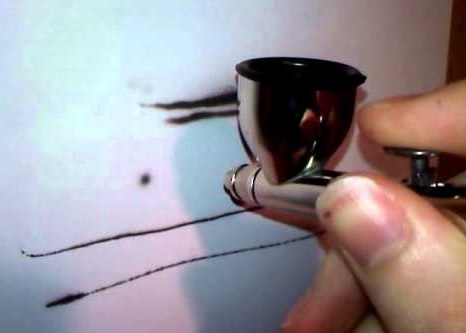 This could occur due to an air leak in the nozzle area/air cap or due to tip dry/blocked nozzle, a loose air cap/head or even a split airbrush nozzle. Loose air cap/head – just tighten it. Tip dry/ blocked nozzle – clean it or replace if needed. Nozzle seal worn/damaged – replacement needed. Split nozzle – replacement needed.